Cleveland-Tamir Rice: Police says 12-year-old Tamir Rice was directly and proximately responsible for his own death at hands of police. 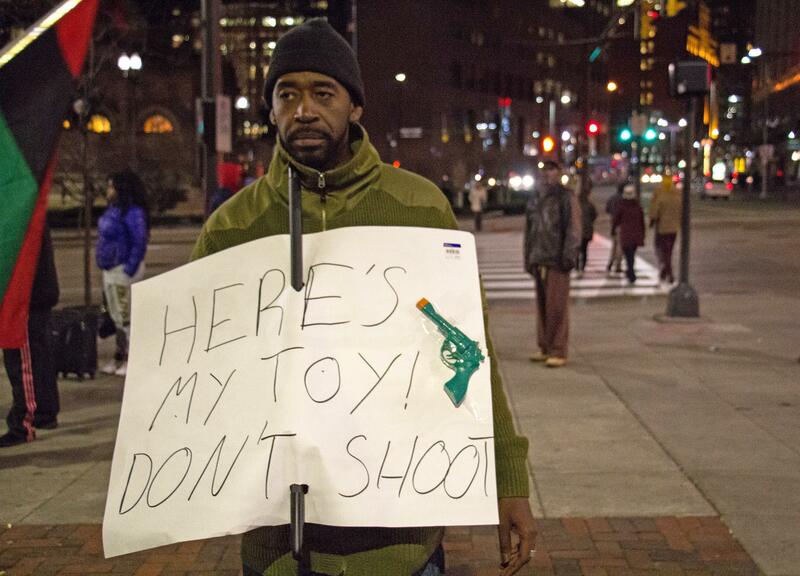 A man holds a sign in Cleveland on Nov. 25, 2014, referring to the fatal shooting Nov. 23 of Tamir Rice. The city of Cleveland has decided who to blame for the death of Tamir Rice, a 12-year-old boy who was holding a toy gun when he was shot by police this past November: Tamir Rice. As Cleveland.com explains, Cleveland’s court filing is light on specifics, something that the city has attributed to the fact that the Cuyahoga County Sheriff’s Office has not yet finished its own investigation. This post has been updated with additional information to include the quote from the police union chief and the mayor.